What do you like, try on a few dresses to get a feel for your taste, see what will fit your body. It takes about 60-90 minutes long. Tip: do not bring too many people along, it results in too many opinions and a confused bride. Consultations are free. A design sketch is drawn on paper during consultation. Final sketch may be delivered later. 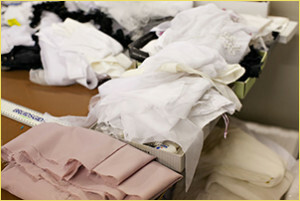 It all starts with high quality true Bridal fabrics purchased at a speciality Bridal store. I work with one or a combination of Satin, Silks, Taffeta, Organza, Chiffon, Tulle, Lace, Duchess Satins, Georgette, and many more. Colours and tints vary and give the dress a personal feel. 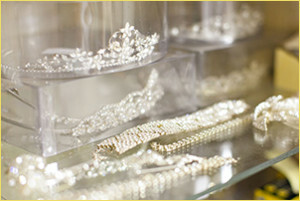 Pure whites, creams, ivory, beiges to pastels. Fabric choice is extremely important when constructing a Wedding Gown as the gown will not fit properly on the body when using low quality fabric. 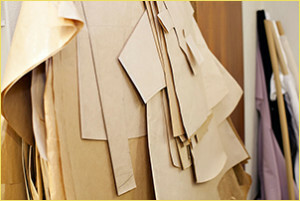 There is a world of a difference between a cheap Satin fabric and a high quality Satin fabric. 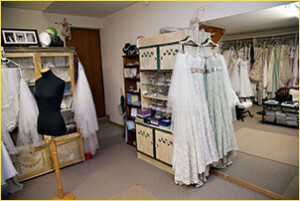 I have samples of Standard fabrics at the studio, but lace and beaded fabrics need to be purchased with the bride present. Her input is required at that stage. The next step is drawing up the paper pattern. There’s a right and wrong way to construct Wedding Gowns. 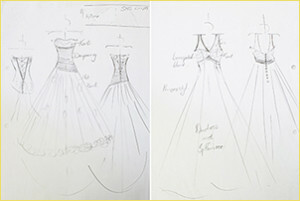 Every gown starts with creating the proper pattern for the size and/or measurements to fit the silhouette of the gown. Since every woman is shaped differently, a size 8 pattern differs from a size 16 pattern. This means that all of the darts and curves must be in the right places for that specific size and silhouette. Women are seldom a perfect standard size; therefore each pattern is individually drawn. The dress is cut from a calico fabric and the bodice and fitted parts are sewn. The calico dress is fitted on the bride and alterations to the pattern made. This makes the fit even more perfect. The alterations is transferred to the paper pattern. 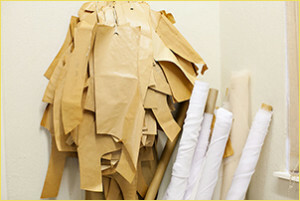 The fabric is cut and the construction of the dress starts. Most dresses require a corset that will hold the dress tight on the bodice and help carry the weight of the skirt on the hips. 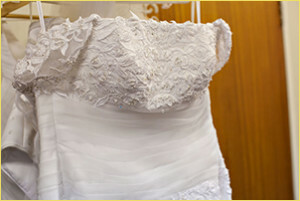 It will give the bride good posture and keeps her from tugging on the dress as she wears it. Strategically Aligned Boning Channels are sewn in the lining to insert the boning. Boning channels are aligned along the seams, front and back of the bodice to provide additional support. The amount of boning will depend on the size and style of the gown. Fit the bodice to see if the fit and length of bodice is correct. Skirt is tacked on to help the fit. After the exterior/base of the gown and the fully boned lining is created separately, we then move onto the design features of the gown. 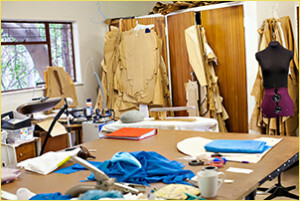 All of the design elements are also made with the finest quality and care. Crystals, embellishments, lace and lace trims may be added at this stage. One week before wedding to see if it all comes together. Bridesmaids learn to dress bride (must be present). Delivery of dress is +- three days before wedding (unless other arrangements were made). 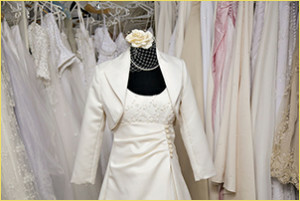 More fittings may be required if dress elements are changed or the bride’s shape changes.